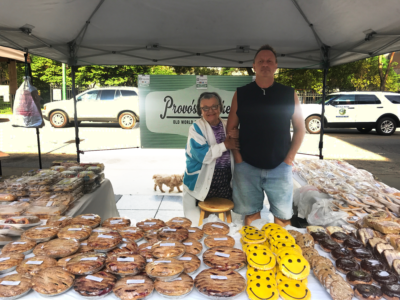 The SOAR Farmers Market curates a variety of vendors offering locally grown and produced products- from farmers to florists, and butchers to bakers. 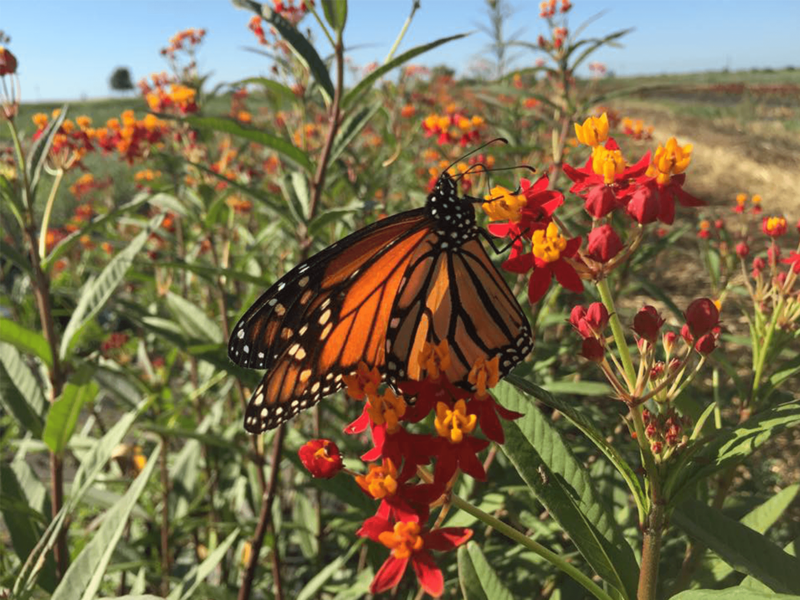 The 2019 SOAR Farmers Market is at full capacity and we are unable to accept any requests from new vendors. 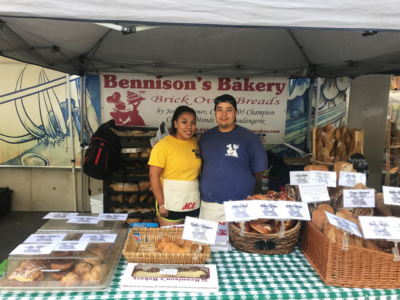 Bennison’s Bakery has been making great baked goods on the North Shore since 1938. They have an emphasis on European-style pastries, cookies, and custom-decorated cakes. A local bread baker. They have tasty fresh baked breads like: 9 grain, whole wheat, focaccia and rolls. 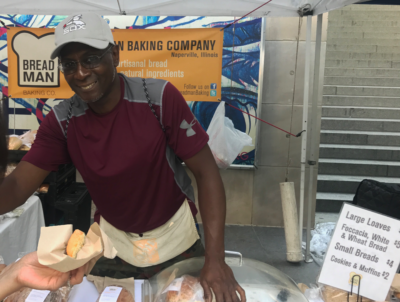 They have a loyal following at the market and some breads go fast. So get there early! 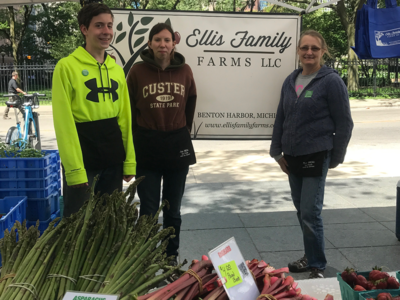 This Michigan family farm specializes in fruits but they also have some great vegetables and honey. In the fall the best apple cider you will ever have. 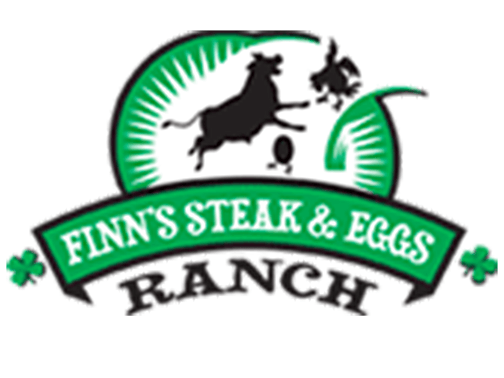 Finn’s Steak and Egg Ranch offers pastured raised beef, free range chicken eggs, and other locally grown products. It could easily be the best grilled cheese you will ever have. They have taken grilled cheese to a new level by adding unusual ingredients, such as bacon, onion jam, pork sausage and poblano mustard. 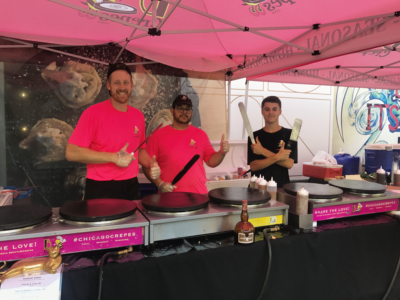 Fresh, made-to-order crepes. They have a variety of offerings, both savory and sweet. Most of their ingredients come from the market itself. So they are super fresh and locally-grown. They offer two kinds of soups to go, which change from week to week. 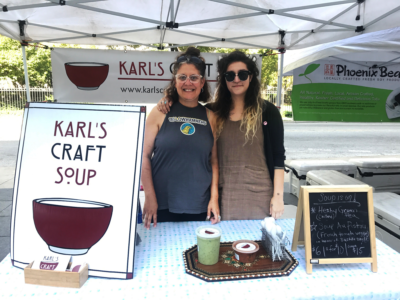 They make their delicious soups using seasonal ingredients, many of which are purchased at the market. 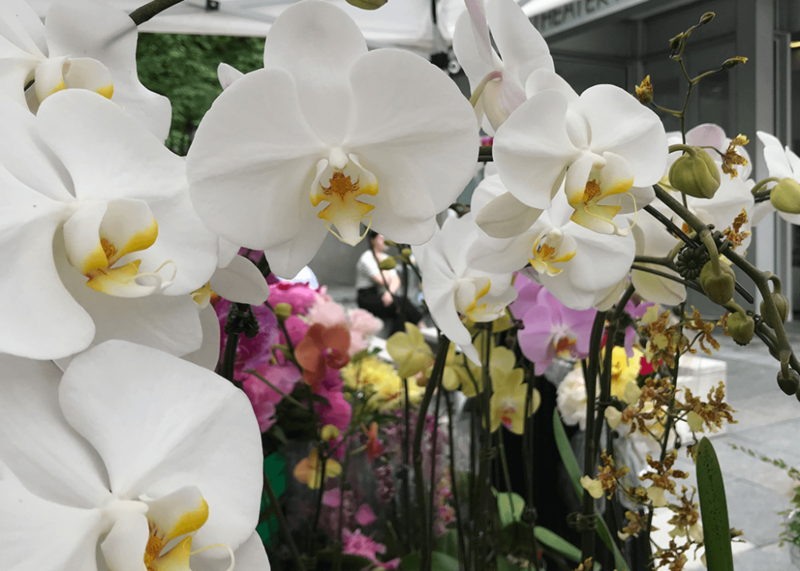 Klehm Growers specialize in orchids, and sell a variety of orchids as well as cut flowers, potted plants, and succulents. 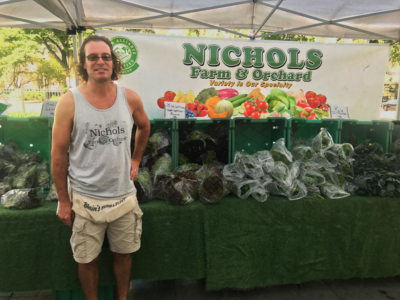 They specialize is high-quality organic produce and herbs. Once you have their tomatoes you will have a hard time eating the boring ones you get at the supermarket. A great new addition to the market. 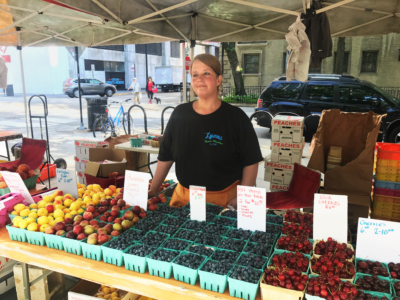 They offer fresh, locally-grown fruit along with farm fresh, cage free eggs and potted plants. 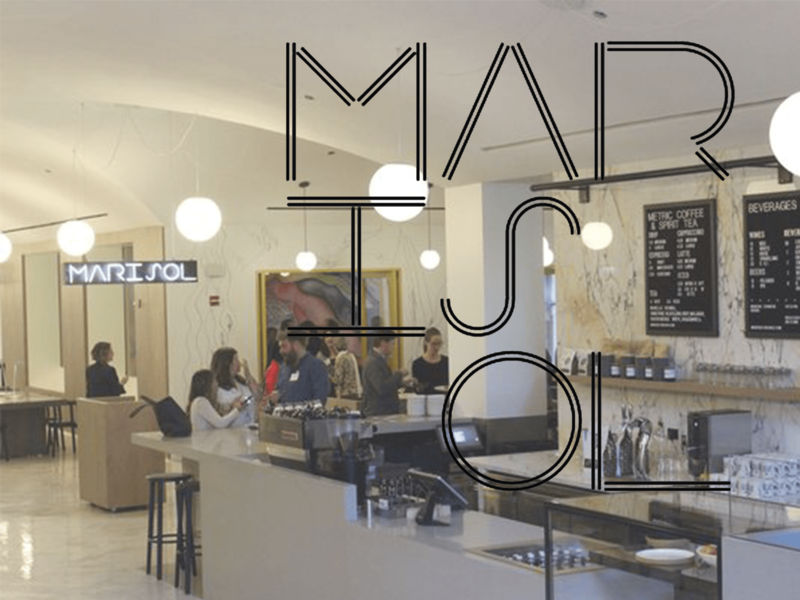 Marisol, the new restaurant and bar at the MCA features innovative flavors from Chicago chef Jason Hammel. Marisol will sell their speciality coffee on the plaza at the Farmers Market. The largest of the produce vendors. 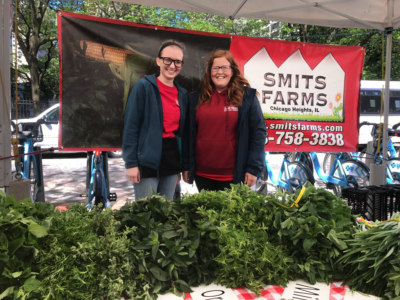 They have a huge variety of in-season fruits and vegetables including apples, strawberries, potatoes, kale, radishes, leeks, pumpkins, peppers, onions and dozens more. 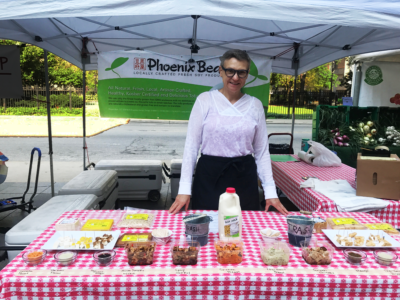 They also have some more exotic offerings that you will not see at many other places such as kohlrabi, shishito peppers and ground cherries. Probably the most diverse of all of the vendors. 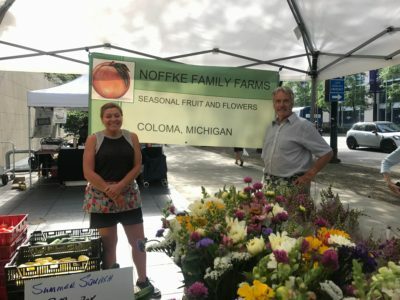 They have great fruit from Michigan along with fresh vegetables like asparagus. They also offer plants and flowers and, to round it out, fresh chicken and duck eggs. Yes duck eggs! If you have not tried them and you like fried eggs, you simple must try them. Small batch tofu. They use only the finest Illinois-grown non-GMO soybeans with no additives or preservatives to create their flavorful tofu in small batches. Their tofu products are naturally cholesterol and gluten free, and contain no trans fats. The freshest pies, pastries and sweets will lure you in! No one can walk by without stopping to admire these works of art. 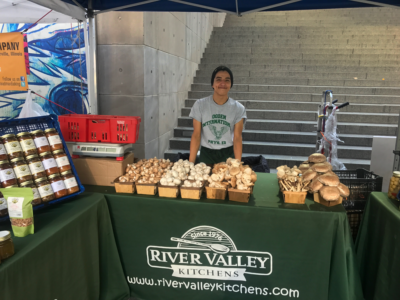 Mushrooms abound at their tent but do not let that distract you from buying the great sauces and spreads that they offer. They also sell tamales featuring what they grow themselves. A go-to for great herbs and plants. You can get a large bunch of herbs picked within a day from them for a dollar or two or you can go to the grocery store and spend $5 for some wilted, tasteless herbs. 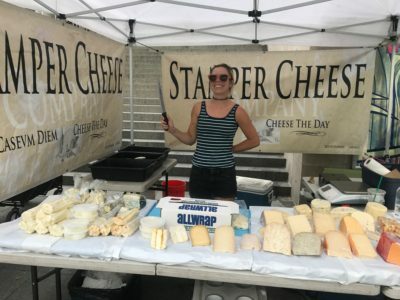 Every week, Stamper Cheese brings some of Wisconsin’s best cheese to Chicago. Their aged cheddar is spectacular. The pistachio roll is the world’s best cheese spread. 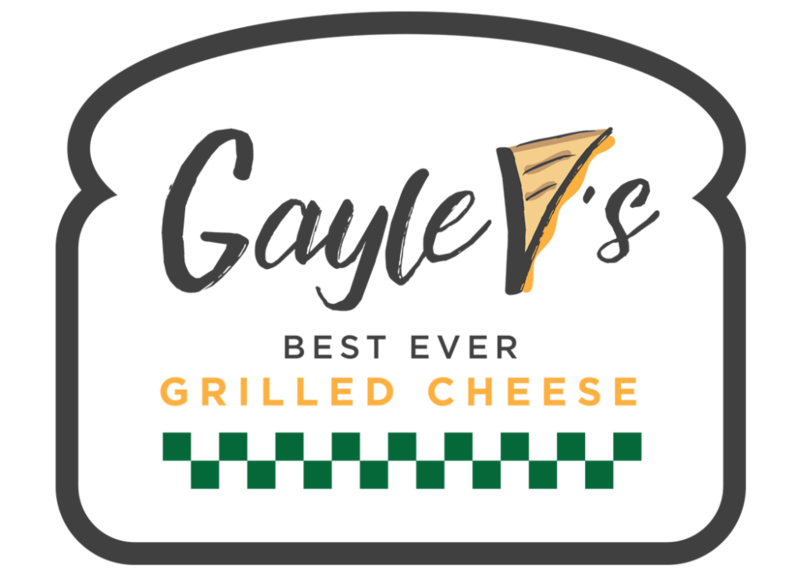 Every cheese they have is very good. Stop by and ask to taste some and we guarantee you will not be able to resist buying something. 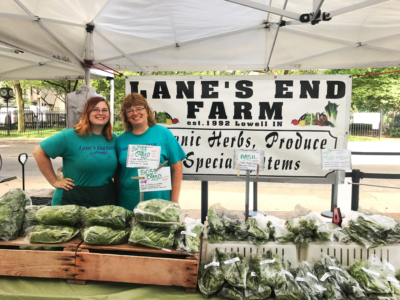 From Saint Anne, Illinois, The Flower Garden brings fresh cut flowers to farmer’s markets all over Chicagoland.